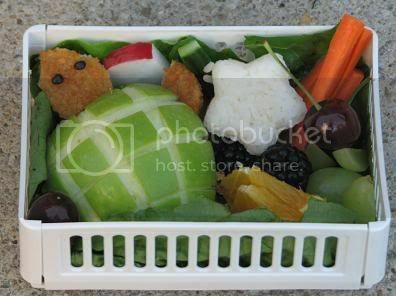 And here is a bento lunch using the turtle shell apple. Kidlet has a turtle made of apple with head and arm being Boca nuggets. Alongside are a star rice ball, blackberries, cherries, orange, grapes, carrots, radish and cucumber. The radish is the first from our community garden. The vegetables are starting to sprout up fast it is so exciting! There is nothing more delicious than veg from your own garden. Your bento lunches are so creative! I'd love to direct Foodista readers to your blog. If that's ok with you, please add your choice of widget to this post and you're all set!